“There comes a specific point in your life where you can reach or obtain near mastery of one specific subject. After that, there’s a base of knowledge that you can (and will) build analogies on. By doing so, you take one industry and mirror it into another industry“. Neither–life is not full of binary decisions as much as our brains would wish it would be. Life is complicated. Over my many years of learning, iterating, and teaching, I’ve arrived at the conclusions that the process of learning, as humans, can be abused, tuned, and scaled easily. There comes a specific point in your life where you can reach or obtain near mastery of one specific subject. After that, there’s a base of knowledge that you can (and will) build analogies on. By doing so, you take one industry and mirror it into another industry. 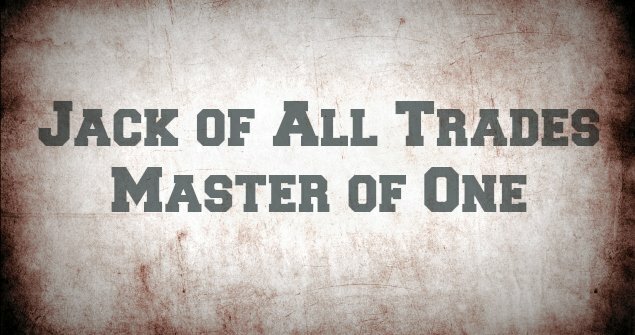 I would emphasize, you can not be a jack-of-all-trades without being a master of at least one. Perhaps it is social skill, doll making, mathematics, language, emotional awareness–you must be a master of as least one in order to be a jack of many others. Learning, as a process, can be abused. We have flash cards, mnemonics, lists, and many other tricks we have refined as methods of study. Education, though still lacking, has in-fact created a significantly more knowledge competitive world than we had in the past. What if you could unlock the multiplier for learning, take learning to a magnitude of powers which allows you to apply specific domain knowledge on to multiple subjects and fields? Though mastery of one does not guarantee mastery of another, but it gives you a significant coefficient for learning. Mastery of one trade can be converted into a catalyst for learning other fields. You have something to pull from, complex ideas you can pattern match, and metaphoric analogies that can complete a picture.